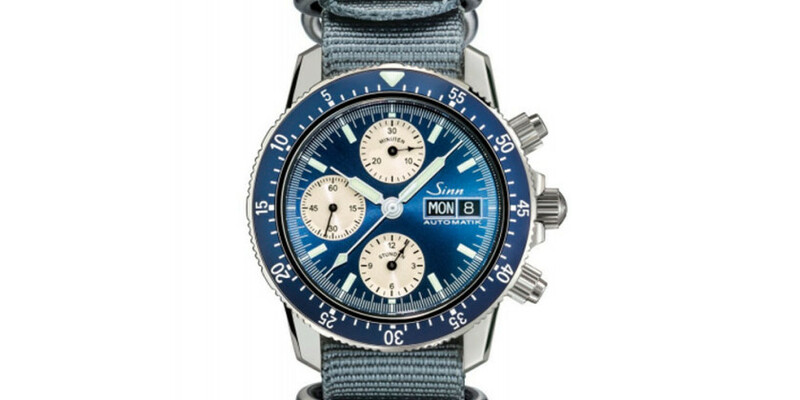 The Sinn 103 A Sa B is a traditional pilot’s chronograph with blue and silver electroplated dial limited to 500 units. The technological features of the watch demonstrate its suitability for everyday use. For example, Ar-Dehumidifying Technology guarantees increased functional reliability and freedom from fogging. The captive pilot’s bezel with minute ratcheting features a luminous triangular main marker. Indices and the stopwatch hour, minute and seconds hands are coated with luminous paint, which enables perfect readability – even at night. The chronograph features a polished stainless-steel case and sapphire crystal glass, which is also used for the transparent back. The watch is resistant to low pressure, pressure-resistant up to 20 bar, shock-resistant and anti-magnetic. Being an exclusive edition, the 103 A Sa B is limited to 500 units. To match the blue electroplated dial, the watch comes with a blue cowhide strap with alligator embossing and white contrasting stitching as well as an gray textile strap as part of a set in a fine case. This allows the wearer to change the strap to suit the occasion or purpose. Sinn 103 A Sa B Pilot Chronograph Watch : Best Watches under $5000 0 out of 5 based on 0 ratings. 0 user reviews.